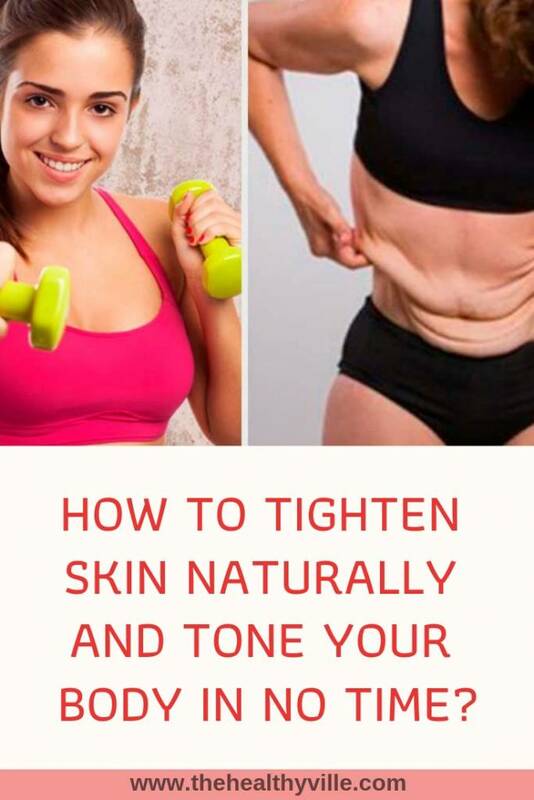 Home Fitness How to Tighten Skin Naturally and Tone Your Body in No Time? Learn how to tighten skin naturally, without the need of liposuction or other medical procedures. There are some simple tips that will bring you awesome results. The loss of excess weight benefits health. However, it can cause sagging skin and look bad. Learn about our recommendations how to tighten skin, tone up and look better. The loss of excess weight, without doubt, brings important benefits for health. However, in some cases, losing a lot of weight quickly leaves the skin sagging, so we must take certain considerations to get the skin tightening. Flaccidity occurs when the tissues that support the skin are stretched after a rapid loss of weight. Also, with age the production of collagen in the body is reduced, and flaccidity is more noticeable. Anyway, you can tighten the skin and reduce the effects of flaccidity in the body. We mention some of them below. Learn how to tighten skin with some simple tips that eventually bring awesome results. Hydration is an important factor for the skin. Drinking at least eight glasses of water a day can tighten the skin, make it brighter and more elastic. You can even combine water with some type of infusion, tea, or some fruit in particular. A proper diet will help you in your task of tightening the skin. It is important to take a diet that promotes the production of collagen in the body. Add to it the consumption of shakes and vegetable proteins. Also, it is necessary to consume fruits that have a high amount of vitamins and antioxidants such as strawberries or beets. All this will help to tighten the skin, and tone muscles. The consumption of fruits and vegetables brings great benefits for the health in general. Toning exercises help reduce excess skin. Do exercises that shape the body and tone muscles, are useful when dealing with flaccidity, allowing to recover the firmness of the skin. You can practice exercises with weights or gymnastics combined with exercises that involve moderate lifting of weight. Further info: Prevent And Postpone Sagging Skin On Face Using This Completely Natural Face Mask! Apply some type of cream on the area where there is flaccidity, can help to firm the skin, provide greater elasticity and improve circulation. You can also opt for the use of the sap of aloe Vera or aloe, applying it on the area of ​​the thighs, abdomen and arms. The properties of aloe Vera allow the production of collagen, which greatly benefits our skin. Excessive exposure to the sun, or the incidence of ultraviolet rays can bring serious health problems, as well as the deterioration of the skin. Therefore, if you want to improve the elasticity of the skin, avoid exposing it excessively. Apply sunscreen even daily, not only when sunbathing. In all cases we recommend a broad spectrum sunscreen that offers protection against UVA and UVB rays. If you are overweight and are starting a diet or exercise routine, do it in a moderate way. Avoid demanding weight loss faster because it can bring undesirable consequences, in addition to skin flaccidity. The goal of many people is to have an ideal weight but it is also necessary to take care of the skin. When flaccidity is extreme, surgery is usually chosen to eliminate the flaps. But, only a specialist can evaluate if it is possible and advisable. Meanwhile, work for your body and take care of it. Don’t forget to SHARE how to tighten skin with your friends and family on your social networks!